Great Vanity Stool & love the color! It is exactly as pictured and I would definitely recommend this to anyone. You cant beat the price either! Perfect for my vanity. It is used daily. Really well made & lovely fabric. Just a little lower than I was expecting but works fine! Very pretty nicely padded exactly what I needed to go with without matching an antique chair. very nice quality. Arrived promptly and was just as advertised. May add casters as others have mentioned. Would be nice if the top were hinged instead of a separate piece, but since it's very light weight, not much of a quibble. Like that the top and base have different but compatible fabric patterns. Looks elegant. Very nice and well made. Love it! Was looking for a desk seat and storage for a bedroom. This ottoman worked perfectly! It's sturdy enough for a seat and has storage and look classy! 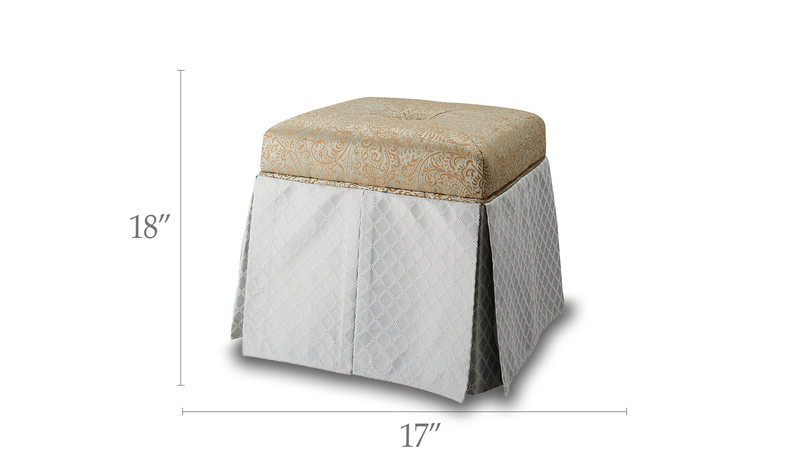 This is a classy, but inexpensive stool for the price. I put casters on it, so my wife can more easily move it.